Only 7 of us stuck with the plan and went to Wales on Friday night. 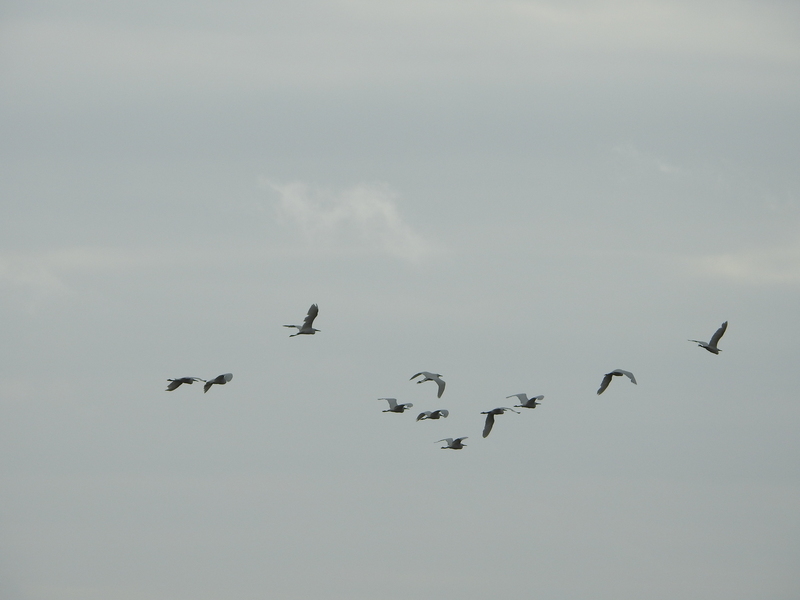 A few cried off due to poor forecast – but the forecast turned out to be ever changing. Saturday morning was meant to be dry but it started spitting soon after we went to the upper tier of Craig Pant Ifan. Jayne came up with us – but then headed off for a walk/scramble up Moel Hebog and dropped down to Beddgelert before heading back to the hut. She enjoyed a long walk, arriving back at the hut via a lift from a friendly bus driver. 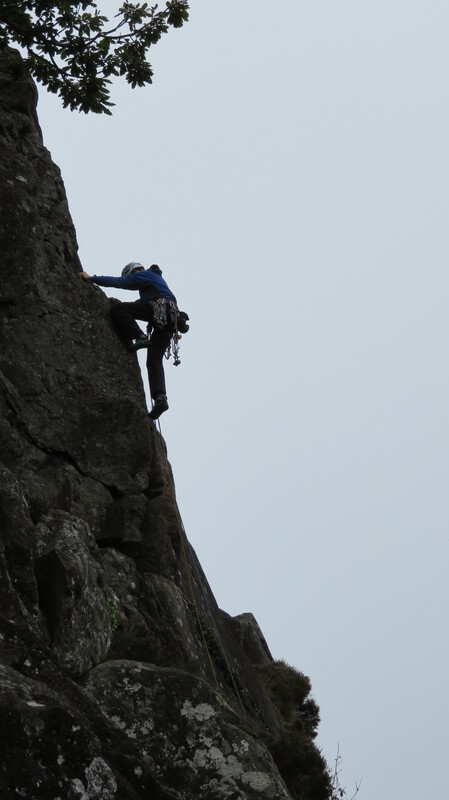 The rain held off for a while so we got a few routes done before the rock was saturated again. So we went back to the hut for some food and drink and warm up. Come 3pm the rain had stopped and sun gradually came back out – so Simon and I, Peri and Dave D headed out and climbed Christmas curry. We had the crag to ourselves. The first 1.5 pitches were on wet rock but after that it was all dry and lovely later afternoon. Meanwhile Peter had been out on his bike from Tal y Bont, on A496 between Harlech and Barmouth, a circular route taking in Pont Scethin, 12 miles, hard and short, pushed up the two steepest hills, one customary crash on way down Bwlch y Rhiwgyr. Rich arrived Saturday evening and was soon telling stories of D of E chaos. Soup, sausages, veg and scones were swiftly consumed. 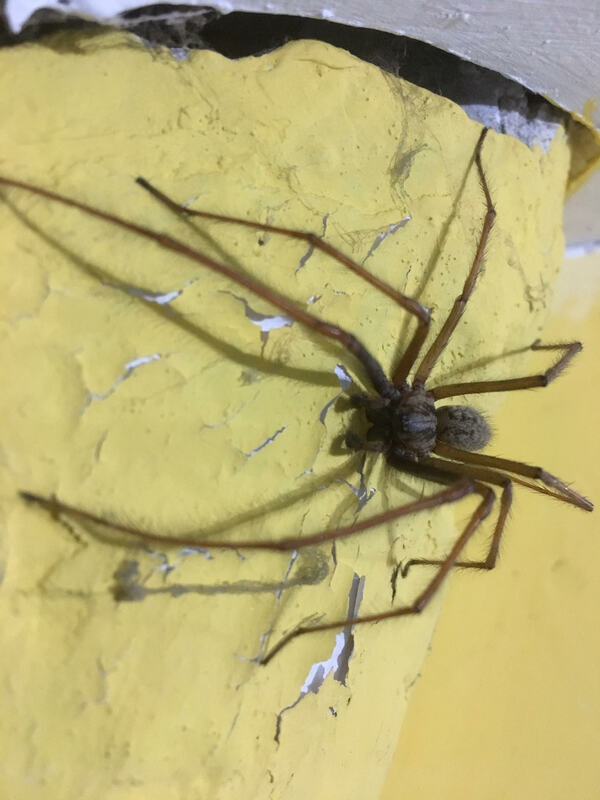 This was accompanied by squeals and swearing as the size of the kitchen spider was realised (by Peri). Has any of us brought it home?? Sunday morning was dry and soon turned sunny. 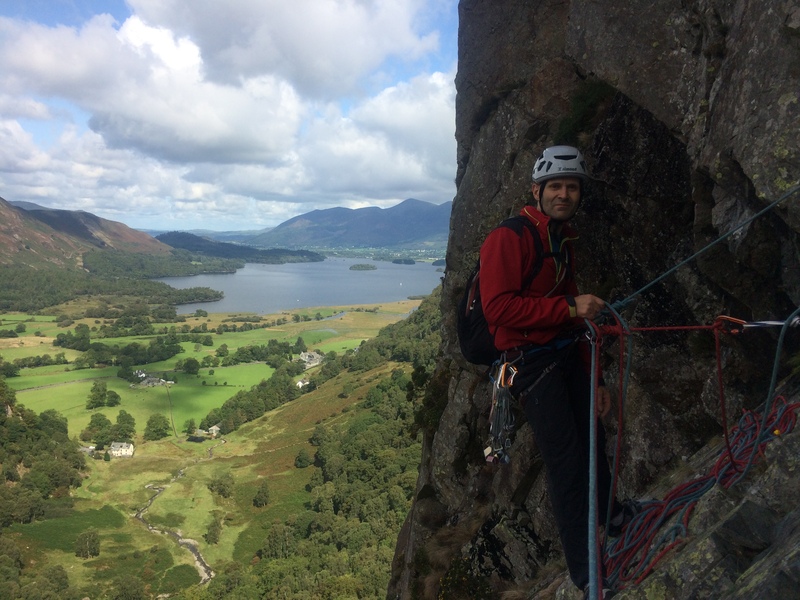 Rich was going to climb with Dave D but injured himself on the way to the crag – so Dave D, Peri and Pete B climbed together in the Yogi area – climbing Yogi and Smarter than the Average Bear. Meanwhile Simon & I climbed Valerie's Rib Direct, Tro and a newly cleaned Quercus. Meanwhile Jayne and Peter went for a walk – Rhinog Fach starting up Cwm Nantcol then via Lyn Perfeddau and Lyn Hywel – and were rewarded with good views and mountain goats. Back at the crag the rain started just as we were finishing climbing and we managed to be back in the hut when the heaviest shower arrived. The walkers soon returned. A good weekend's climbing/walking/cycling despite the weather forecast. Never fully trust the forecast! 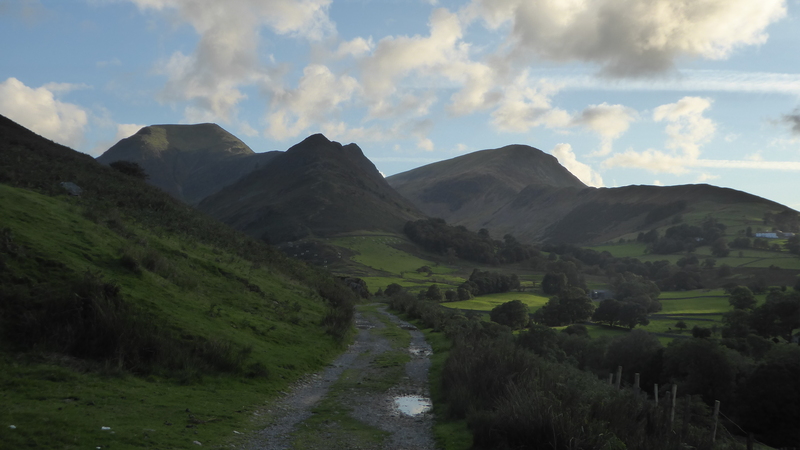 For the August bank holiday we headed to the Newlands valley (Stair) to avoid the crowds in the Lakes. Good turnout for the trip – 15 of us present at some point over the weekend. 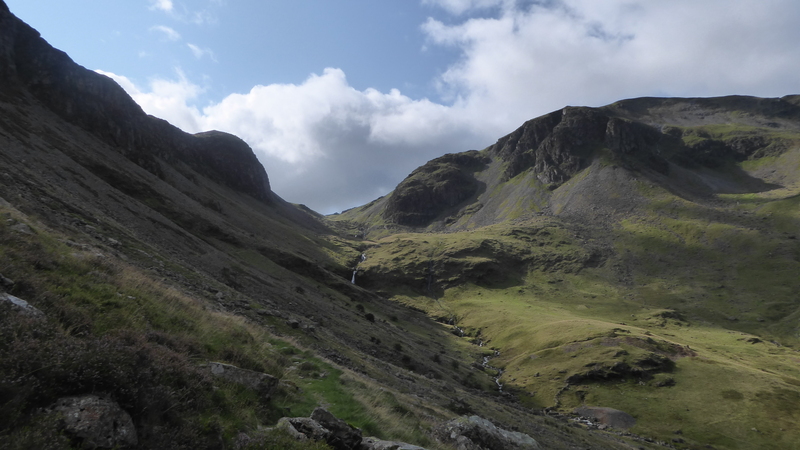 Saturday – Simon & myself walked from the hut up towards the head of Newlands Valley to climb Direct route with bolt finish (allegedly S **) on waterfall buttress and then grey slab (VS 4b **) on grey buttress. The first route wasn't worth any stars (damp/wet, mossy & vegetated) second one was though (clean, solid rock, variety of moves). Mike & Rob set off just before us and were a little further up the valley on Miners crag – words from Rob. 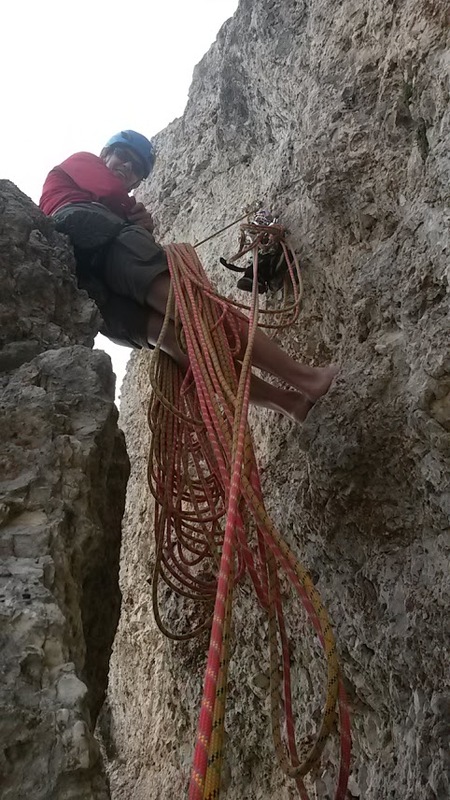 "Miners Grooves, horrible approach pitch, pretty good P2 & P3, Jezebel , terrible P1 and start or P2, with 10m of good climbing and Tahulah – great clean climb on good rock ! I actually quite liked the crag (remote, quiet, easy to get to, sunny after 11) but the starts of these ** routes are wet, mossy, sh!te. I will certainly be more circumspect about belaying well out of fall line with this sort of route.. obvious in retrospect but maybe a reminder for others". I hope Rob's foot improves soon! Meanwhile Natalie and Russ went for the classis of Troutdale pinnacle on black crag followed by Little Chamonix at Shepherds- somehow managing to time things right and avoid queuing. 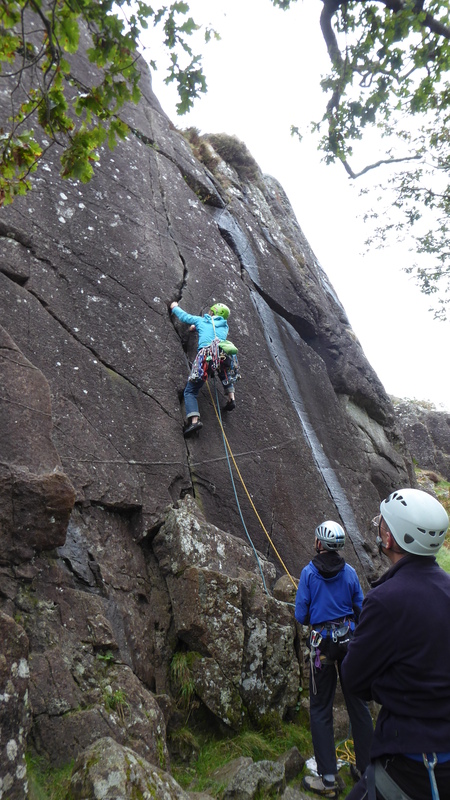 Peri, Adam and Andrew also went to black crag in the hope it would be dry enough to do The Shroud and The Mortician. Arriving there they found The Shroud was absolutely soaking. The Mortician looked as if it might be dry after the first pitch so we started up that, but bailed when they found the second pitch was a river. So like everyone else on the crag they defaulted to Troutdale Pinnacle which was lovely. "A really enjoyable day out even if we had to change our plans". Annie and Donal went for a mountain bike ride around Blencathra and Skiddaw – which they seemed to enjoy a lot. Dave D having reclaimed his car keys from M&S (don't ask!) arrived at the hut after a walk up Helvellyn (apparently that's where the crowds were). Unfortunately Saturday turned out to be by far the best day. Sunday and Mon am were wet. 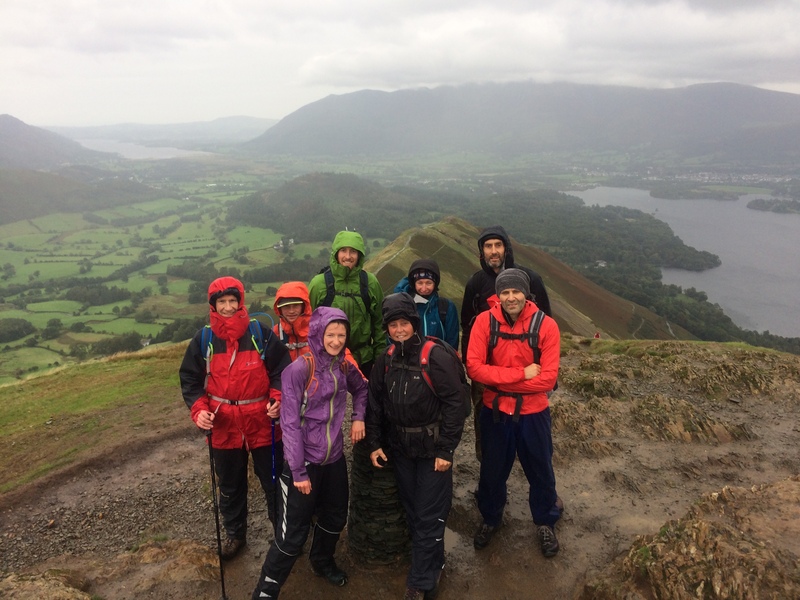 There were 2 walking groups up Newlands valley on Sunday – taking in Cat bells and the ridge along Newland valley. Natalie extended the walk somewhat by running back to Keswick and meeting Emma for a session at the wall. Meanwhile Simon, myself and Alan took part in the 3rd race of the Kong mini-mountain marathon series, which started off from the outskirts of Ambleside – cloud was down in places, windy in places and rather wet, especially when wading through bracken – all good fun. Monday am most people left decided to leave the Lakes as it was still wet. But some stopped somewhere en route for a bit of exercise – Annie did a walk from Arnside, Donal cycled round Dalby forest, Natalie, Russ and Mike went bouldering sans mat at Roundhill, Simon & I stayed in the Lakes for a trip to Leighton Moss. C3 and Karl were heading to the Keswick show – but opted for Netflix instead. Good weekend – despite the weather, good curries and cake. We arrived at the apt (Cèsa Raggio di Sole) about midnight and were pleased to find the extensive dithering had paid off. A great little apt, newly decorated, comfy, and cheaper than camping. 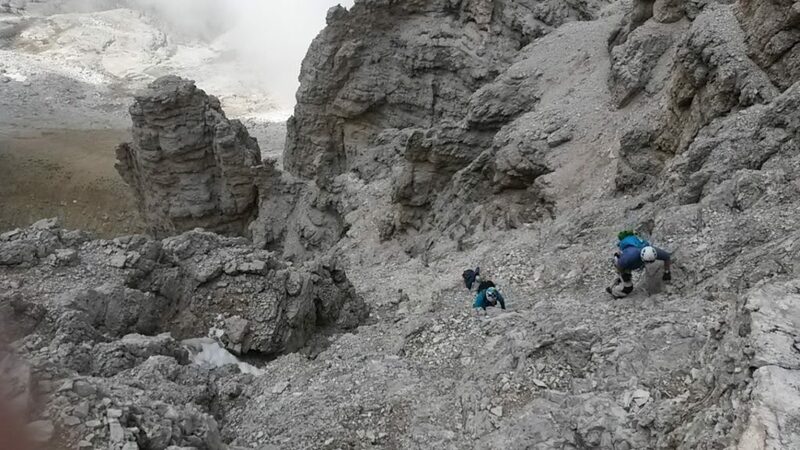 Though we had no crags right on our doorstep, we were pretty well located for the Western end of the Dolomites, with a huge selection of crags (a.k.a. mountains!) within an hour's drive, inevitably involving going up and over a mountain pass – we got very used to those hair-pins. As we'd arrived late we hadn't had chance to pick up any food but with the weather forecast warning of storms later in the week we wanted to make the most of the good weather despite our late start so grabbed a meagre breakfast of apples and cake in the local shop and headed to Sella Towers, a group of three towers right by the road at the top of one of the passes, with a selection of long easy routes to go at. Mike and I climbed Via Fiechtl (V-), a nice route with the crux (for me) being the awkward offwidth on pitch 2. 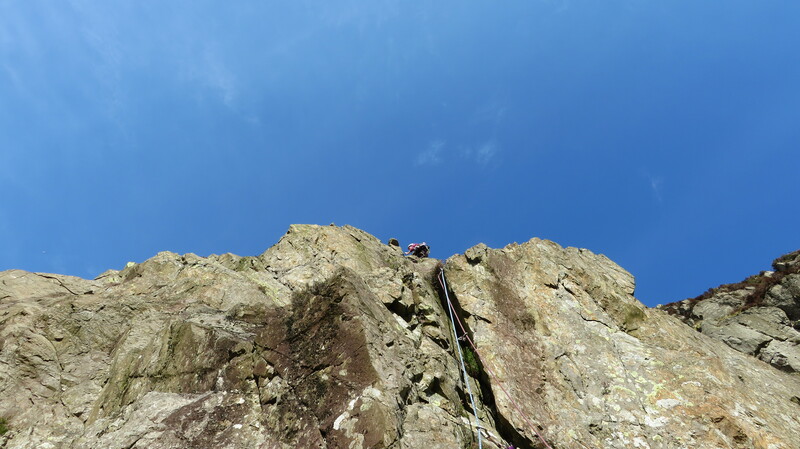 The route culminated with a fantastic couple of chimney pitches, proper traditional back-and-footing, which proved rather easier for those closer to 6ft than 5 ft! Pete and Rob climbed a neighbouring route which shared the first 1.5 pitches. A great start to the weeks climbing, but we got back to the car too late to make it to the shops (silly continental Sunday trading hours) so we scraped together some dinner from the basic provisions we'd got that morning and Rob's secret stash. Little Micheluzzi (Direct Start), a three started V- culminating in a fantastic juggy traverse with spectacular exposure hundreds of metres above the valley floor. The following day had rain forecast for the afternoon so a roadside sport crag (Penia di Canazei) seemed like the perfect option for the morning. This turned out to be a humbling experience, with most of us struggling on 5s and 6s, and I even managed to fall off a 4! The rain arrived just as we were running out of routes, and pulling power so we took the opportunity to do a proper shop, at least that was the plan, continental trading hours had other ideas, so an hour or so was killed mooching around the town, but we finally got some proper supplies. 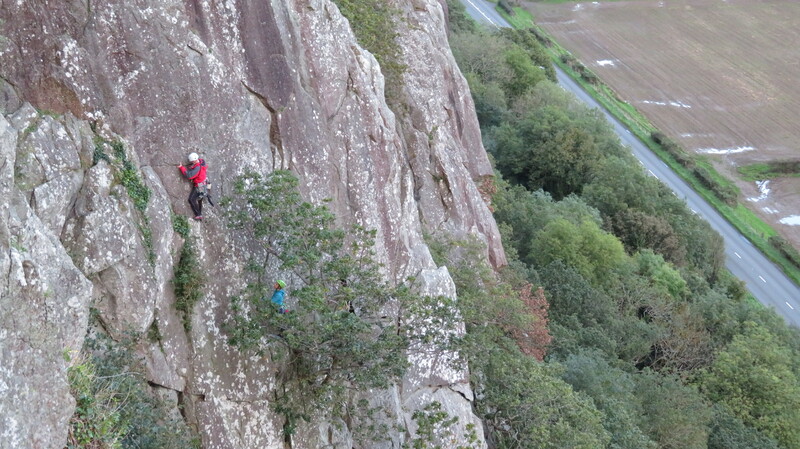 More sport the following day, this time at Sass de Stria, a much better crag with more realistic grading. A few of Rob's mates who'd been camping nearby made an appearance. More suspect forecasts the next day prompted a bit of via ferratta. 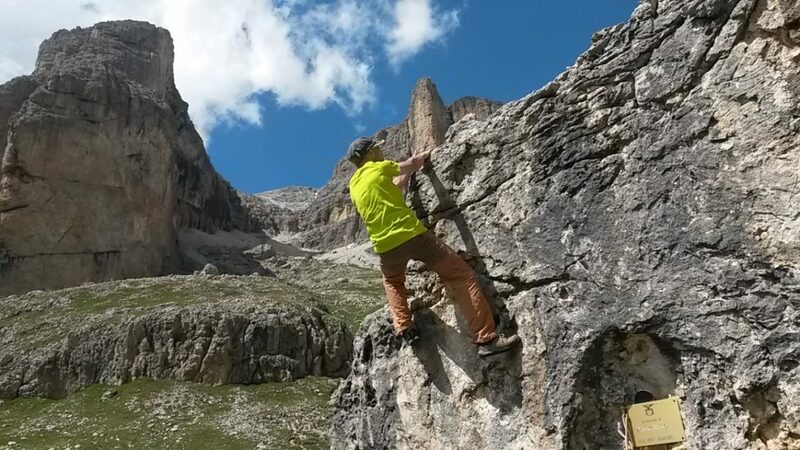 A grade 4c (out of 5) on Sella Towers, which was great fun but over all to soon. The descent from the top was a different story, going via a couple of summits just under 3000m and taking several hours, only to emerge on the road about a mile and a half downhill from where the car was park. I drew the short straw so ditched my bag and went to retrieve the car, however karma was clearly on my side as the others got midged whilst waiting. Paul had been due to arrive that night but due to a delayed flight (a sign of things to come) he resorted to kipping in the car and arrived early Friday morning. With a good forecast one last big route was called for so we headed to Falzarego Towers. Since they were climbing as a three Pete, Rob and Mike went for the easier option of Comici – South Arete (V- *** 6 pitches) whilst Paul jumped in at the deep end and joined me on Dibona (V+ *** 11 pitches). This had some great climbing throughout, culminating with a scary unprotected chimney pitch behind a detached pillar (crux IMHO) leading to a fantastic belay perched atop said pillar. The final pitch (and technical crux) stepped back across off the pillar and pulled through some wild and steep moves to reach the summit. A great start/end to our respective trips. That evening we celebrated with pizza and beer and went our separate ways the following morning, Paul and Rob to find a campsite for the next week, the rest of us squeezed in a couple more sport routes at Sass de Stria before heading to the airport for our flight home. The less said about that the better, let's just say there's a few of us who won't be flying with Ryanair again. An otherwise great trip! I would certainly go back either to the same area (as there's so much more to go at) or elsewhere in the Dollies, maybe in 18 years or so. You are currently browsing the York Alpine Club Blog blog archives for September, 2018.